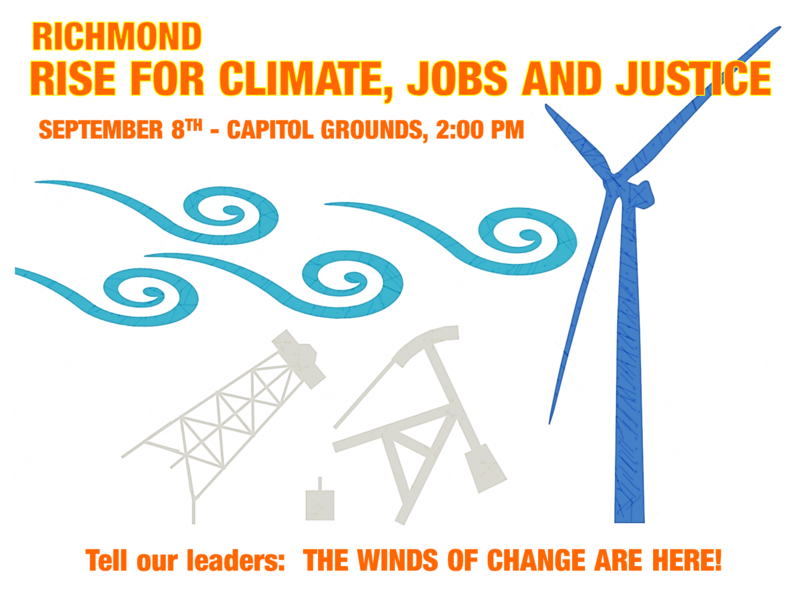 On September 8, thousands of rallies will be held in cities and towns around the world to demand our local leaders commit to building a fossil free world that works for all of us.Join us at our state's Capitol as we demand our state leaders walk the talk on climate action and environmental justice. Our elected officials must commit to public, actionable commitments to a fast and fair transition to a fossil free world. This means no more accepting fossil fuel money, an immediate moratorium on new fossil fuel projects, and a firm commitment to building 100% clean renewable energy by the year 2035. We will gather at the steps of the State Capitol Building on Capitol Grounds from 2:00-3:00 pm. Please wear blue or green to honor our planet and collective home. If you need special accommodations for the event, please call 804-366-0745. Speakers include: Beth Roach, Tribal Councilwoman of the Nottoway Indian Tribe of Virginia; Andrea Miller, Executive Director of People Demanding Action; Monica Flippen, Steering Committee Member of Virginia Interfaith Power and Light; Jessica Bull, Mothers Out Front; and Monica Hutchinson, Lead Political Organizer of the Richmond Metro area for New Virginia Majority.